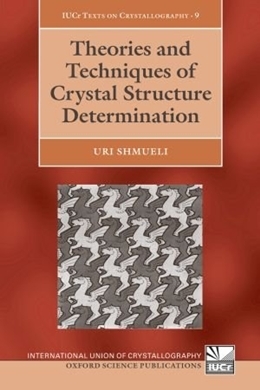 This concise book is for chemists, material scientists, and physicists who deal with description of crystalline matter and the determination of its structure, and would like to gain more understanding of the principles involved. The main purpose of the book is to introduce the reader to principles of crystallographic symmetry, to discuss some traditional, as well as modern, experimental techniques, to formulate the phase problem of crystallography, and present in some detail the methods for its indirect and direct solution which are indispensable for further work. The book also contains discussions of structure-factor statistics, of value for resolving space-group ambiguities, and atomic displacement parameters which form an inseparable part of the structure. A discussion of the refinement of structural parameters, conventional, constrained and restrained, concludes the book. Derivations are, as far as possible, self contained and wherever mathematical detail might disrupt the line of reasoning the reader is referred to one of four appendices present in the book. The book is of course valuable for students of crystallography at a graduate and upper undergraduate level. No previous course on crystallography is a prerequisite for graduates in the above fields.